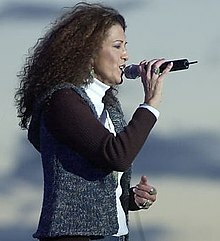 Rita Coolidge performing at an outdoor concert in Seattle in September 2002. Rita Coolidge (born May 1, 1945) is an American singer. During the 1970s and 1980s, she charted hits on Billboard's pop, country, adult contemporary and jazz charts. Coolidge is part Cherokee, and this influences her music. Coolidge married Tatsuya Suda on June 19, 2012 in the Cook Islands. Coolidge was married to Kris Kristofferson from 1973–1980. They have one daughter, Casey. Coolidge also had romantic relationships with Stephen Stills and Graham Nash. Her leaving Stills for Nash has been said to be a reason behind the 1970 breakup of Crosby, Stills, Nash & Young. ↑ "Rita Coolidge Biography". Musicianguide.com. Retrieved 2010-04-10. ↑ Tribune, Chicago. "Rita Coolidge marriage". Retrieved 11 September 2012. ↑ Zimmer, Dave, and Diltz, Henry (1984). Crosby Stills & Nash: The Authorized Biography (First edition), St. Martin’s Press, ISBN 0-312-17660-0.